Welcome back! In this last leg of our journey together we'll explore the continued rise of the Catholic church in Europe through the Romanesque and Gothic eras. This is also the last week before our museum exhibitions, so I hope you'll come back with some great information and perhaps some artifacts to enrich our shows. 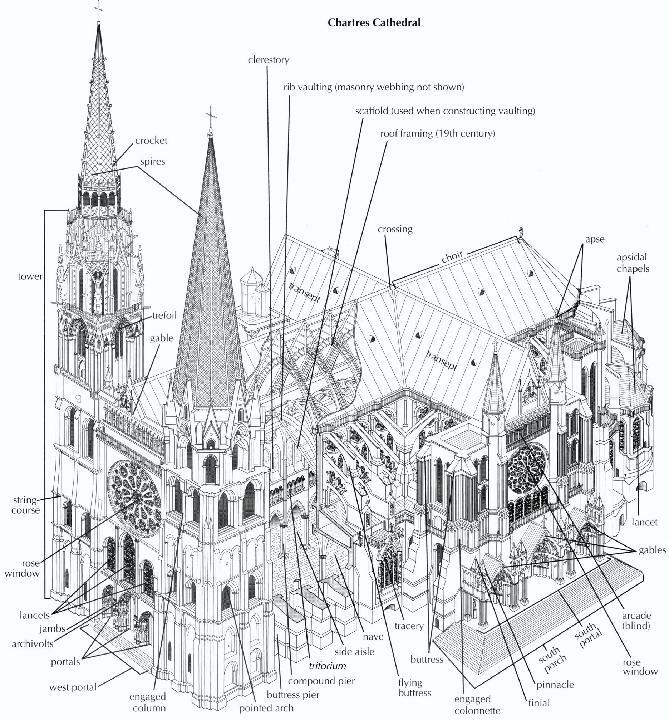 Have a contextual understanding of the Romanesque and Gothic art and architecture. Gain an understanding of various art historical themes that are present within these cultures. Below is a map of the ruling dynasties in late Gothic and early renaissance Europe. Europe was relatively stable through the forging of political ties and even the occasional battle. The outlines of countries as we know them today start to be set, but the Holy Roman Empire persisted through much of central and eastern Europe. 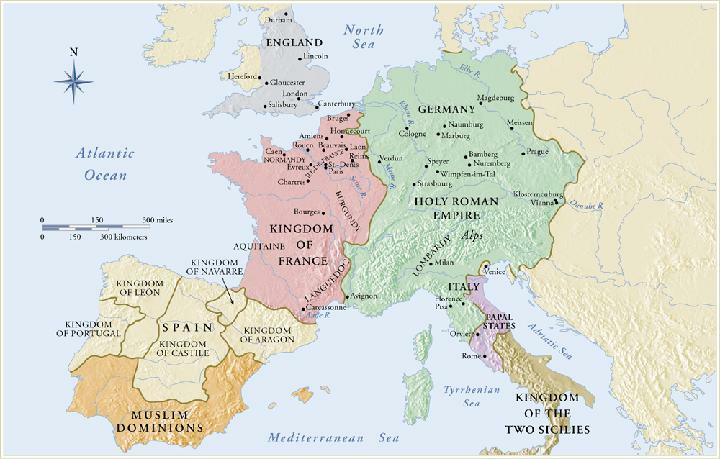 France and England developed strong holds on their territories, and Spain began to develop its identity as a country, though the southern region was still dominated by Muslim territories. Italy was divided into Papal States under the Pope and the religious oversight of the Vatican. Before the 11th century, social strata were centered around a liege lord who would grant tenure of portions of his land to vassals who swore allegiance to him. Those vassals were also expected to serve in his military when needed. Increased trade also encouraged the rise of urban centers and cities along with a middle class, which itself was still ruled under a feudal system. Monasteries and churches were remodelled and new structures were constructed as more people oversaw the construction of churches to honor their towns. Starting in the new millennium each city wanted to create a church more splendid than the previous to show their power and wealth, demonstrate their increasing devotion, and ensure the traffic of pilgrims (and associated income) to their town. Pilgrimages became popular trade in relics grew. Relics were religiously important objects thought to contain mystical properties. Cathedrals often highlighted such relics and gained income by selling chapel space to wealthy families. Pilgrims touring Europe often visited various churches and cathedrals to gain favor from these relics before heading south or east on crusades against the growing Muslim population. Romanesque cities coalesced around powerful families into city states during the Gothic era. Each city state in Italy was governed by executive bodies, councils, and special commissions. Each kingdom had its own source of revenue, and that support system allowed for a period of economic prosperity. Guilds, which were groups those working within a particular trade (much like labor unions today), formed the cornerstone for businesses by providing personal security and welfare as they organized commerce to ensure governmental success. A surge of vernacular literature gave rise to a more uniform languages while Latin remained the official language of Christianity. The growth of classical culture and literature gave rise to Humanism. Humanism focused on a code of civil conduct, a theory of education, and a push for scholarly discipline, each with a growing focus on the power of the individual. Humanists were also keenly interested in antiquity, which itself had been evident in Italy in various ways throughout time. Medieval styles and conventions still dominated, but there was a more conscious attempt to break away from such conventions during the 13th and 14th centuries. Two major events also took place during the 1300s. In 1305 the Great Schism in the Catholic church was sparked when a French pope was elected and settled in Avignon. This caused a divide in the religion as Italians believed that the center of the Catholic church should remain in Rome, so they elected their own Pope who governed from Rome. Each faction continued to appoint and recognize these two popes simultaneously, which led to this break within the church. During the 1340s the Black Death (Bubonic Plague) eliminated 25% to 50% of Europe’s population in only about 5 years. Many scholars believe that this plague led people and cities to commision religious works in the belief that their sacrifices would gain favor with God and help them to find salvation from the outbreak. In the Romanesque and Gothic eras, it is important understand the themes within Christian mythology in order to fully understand the symbolism contained in these images. The Romanesque era takes its name from a style rather than from the location or politics. Romanesque means “Roman-like,” a term first applied in the 19th century in reference to the European architecture of the 11th and 12th centuries. Architecture was highly varied but all have a basis of the old early-Christian, Roman basilica design. The following video gives a great documentary by David Macaulay of the development of architecture at the time along with an animated narrative that summarizes the context of the time as well. Saint Etienne, Vignory, France (1050-1057): Northern style of France. The building is constructed with large sawn blocks of stone beneath a timber roof. An ambulatory wraps around the choir and side chapels, called radiating chapels, stem from it. The apse and chapels may have originally held the church’s relics in a way that pilgrims could circle around and pay respects even during mass. This church is also an early example of how stone sculpture could be integrated into the architecture, as seen in the capitals of the ambulatory. Saint-Philibert, Tournus, France (1060): An example of southern French style. It was built with brick rather than large blocks of stone. Originally it had a timber roof, but around 1060, masonry vaults replaced the roof. The barrel vaults along the nave are supported by transverse arches. The aisles are also very tall, but have groin vaults to buttress the barrel vaults. Saint-Sernin, Toulouse, France (1070-1120): Saint-Sernin was built in honor of the city's first bishop, who was martyred in the middle of the 3rd century. It was an important pilgrimage stop so was also built to accommodate large congregations. The two towers of the western façade were never completed and the crossing tower is built in a mostly Gothic style. This is known as a pilgrimage church type since it contained accommodating spaces for pilgrims, worshippers, and processions. The nave is longer and the side aisles were doubled, which meant that there were two aisles or rows on each side instead of just one. A transept or crossing arm allowed for more entrances to the church. The ambulatory and radiating chapels were also attached to the transept. Its design is geometrically precise as constant ratios were used to bring harmony to the design, which would be fairly common as the Romanesque style continued. The nave is also quite impressive. A barrel vault covers the whole nave, and it is made with cut stone. Groin vaults in the two aisles serve as buttresses and the continuous barrel vault is broken up by piers that form arches that seem to march towards the apse in a rhythmic way. The segments were decorated by moldings on the exterior along with buttresses, which became a tradition for many churches. 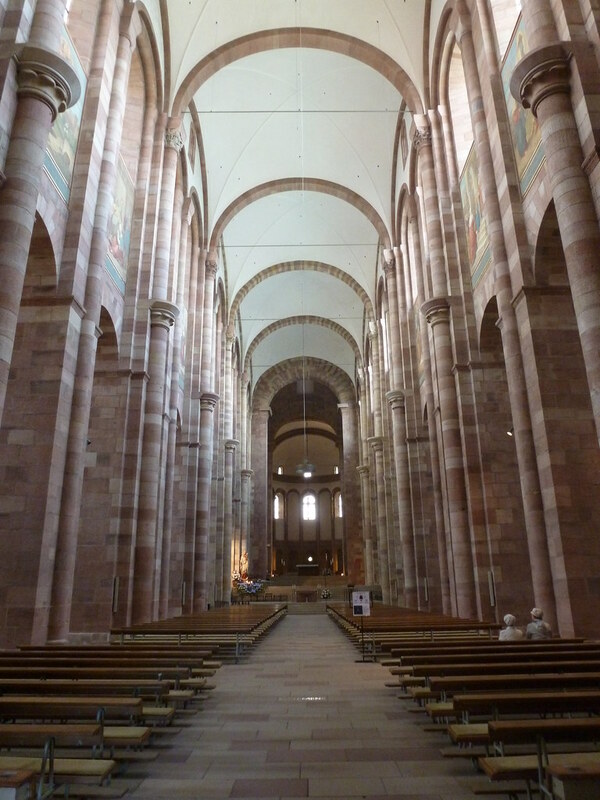 Interior of Speyer Cathedral, Germany (1030-1106): This church was the burial place of Holy Roman Emperors until the 12th century. Continuous barrel vaults helped with acoustics, though they did not allow for great lighting. The challenge became creating a masonry vault system that allowed for more light and was aesthetically pleasing. Covering the nave with groin vaults solved this problem but the builders had to rely on masonry rather than lighter and more maleable concrete. (The secret for making concrete had been lost for centuries.) The nave is 45 feet wide and the vaults reach up 107 feet. A sense of rhythm is created through the decoration and segmentation of the groin vaults. Sant’Ambrogio, Milan, Italy (late 11th century-early 12th): Artistic trends shifted between northern and southern territories. This church was a monument of Lombard Romanesque architecture. Its atrium was produced in early Christian tradition. The two story narthex is pierced by arches on both levels. Two bell towers (campaniles) are joined to the building, the shorter built first and the larger built in the 12th century. The church has a nave and two aisles but no transept. It is also one of the first places to use rib vaulting, which later became more characteristic of Gothic architecture. The church is not considered Gothic, however, because it does not soar in height like the northern churches; rather, it maintains firm roots to the early Christian styles. Saint-Etienne, Caen, France (begun 1067): The Vikings converted to Christianity in the early 10th century and settled in northern France (Normandy). 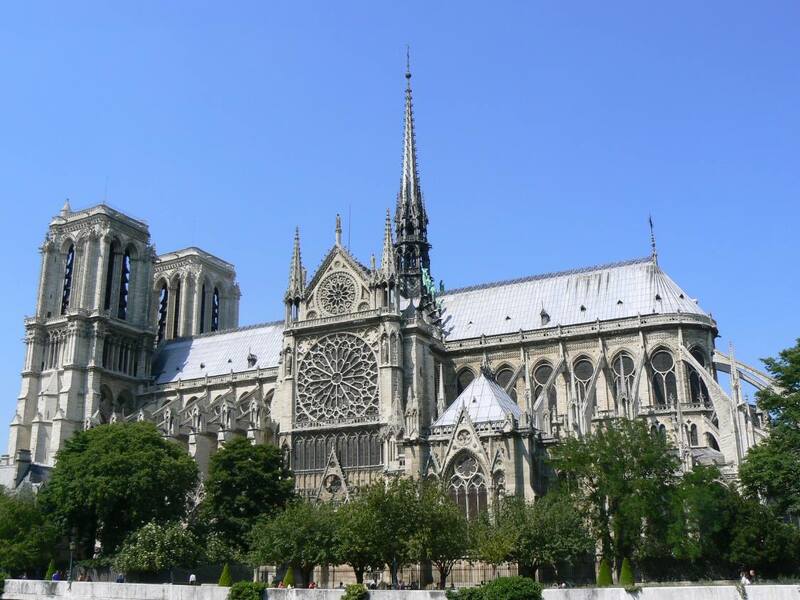 Their style set the foundation for later French Gothic architecture. This church was begun by William of Normandy (William the Conqueror). Its buttresses divide the façade and the towers rise from the divisions. The design closely corresponds with the interior of the church. The interior originally called for a wooden roof, but settled on groin vaults around 1115. The supporting piers flow all the way from the ribbed vaults to the floor into 6 part vaults (sexpartite vault) which provide enough ample space for clerestory window. This makes nave seem taller than it actually is. The reduced wall surface also gives a lighter quality to the interior, which is unusual of the period. Durham Cathedral, England (begun 1093): William the Conqueror’s conquest of England in 1066 began the importation of French Romanesque building and design. This cathedral became the centerpiece of a monastery, cathedral, and fortified-castle complex on the Scottish frontier. It was conceived from the beginning as a vaulted structure. The pattern on the ribs is reflected in the arcade below. The seven-part nave vault covers two bays where large simple pillars ornamented with abstract designs alternate with compound piers that carry the arches of the vaults. The cathedral was built in what became the English style. That style typically included long and slender proportions in some areas while others felt lower to the ground, and there was less care and logic to the overall modular scheme. This cathedral is the earliest example known of a ribbed groin vault with slightly pointed arches placed over a 3-story nave. Arch buttresses extending from the exterior above the aisle were the solution to some engineering problems that Gothic architects sought. Gothic builders would later pull these quadrant arches out from the interior to create flying buttresses to alleviate the weight of the vaulted ceilings. 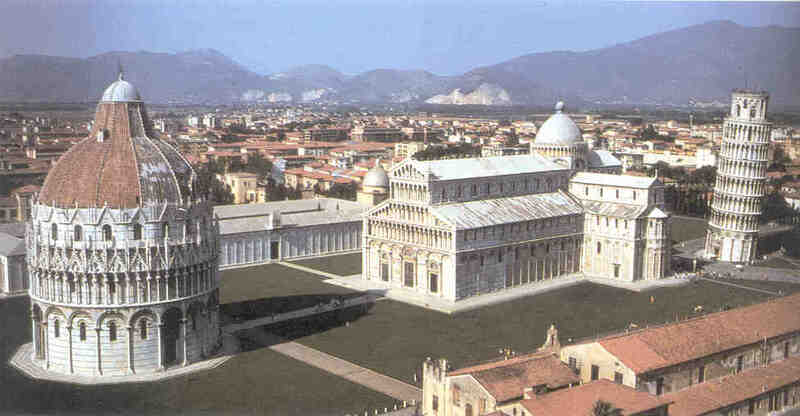 Cathedral Complex, Pisa, Italy (cathedral begun 1063, baptistery begun 1153, campanile begun 1174): This complex was intiially funded by the spoils of conquests against the Muslims off Palermo in Sicily. It strove to act as a monument to the glory of God and bring credit to the city. It includes a large cathedral constructed with four aisles that resembles, in part, an early Christian basilica. It also has a transept and dome over the crossing, and an arched gallery on the exterior façade and interior wall decoration of incrustation (bright panels of different colors), complicate the more simple basilica design. The campanile was detached in the standard Italian fashion. The arched arcades mimic the façade of the cathedral. 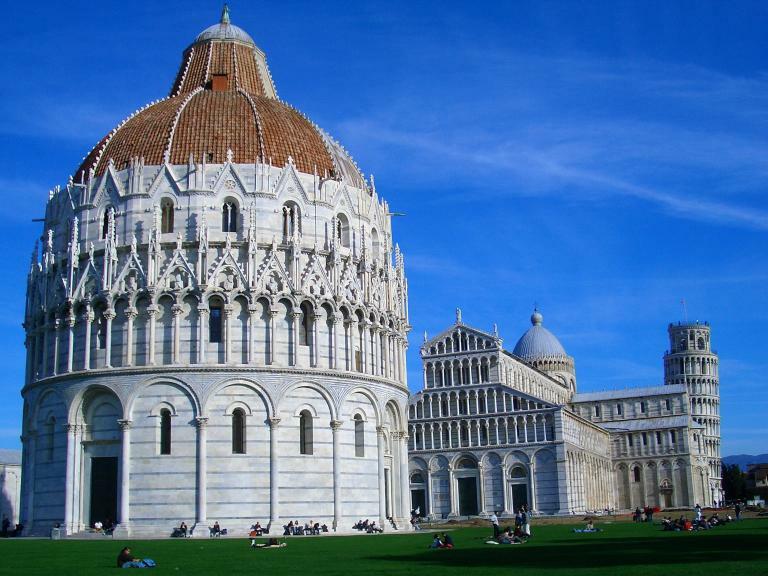 The campanile began leaning even during construction because of its settling foundation. 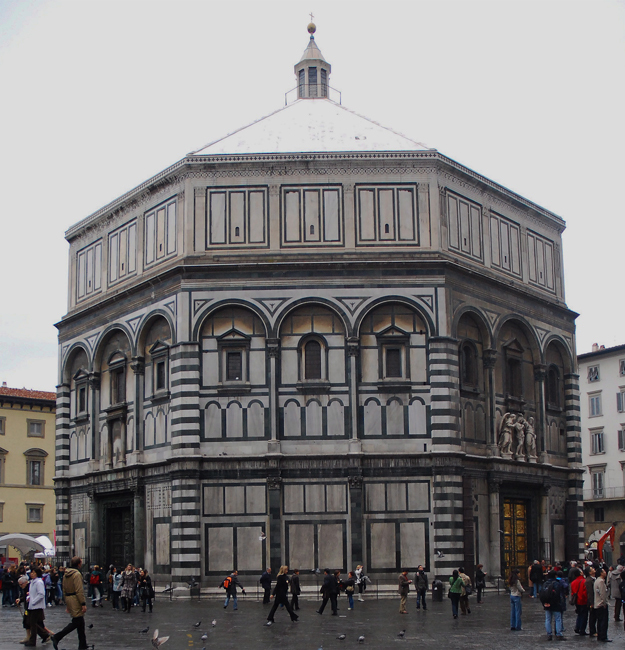 Baptistery of San Giovanni, Florence, Italy (1059): Dedicated to St. John by Pope Nicholas II. It faces the city’s great cathedral. The baptistery demonstrates the importance that people of Tuscany placed on the rite of baptism. It has a symmetrical, central plan and even recalls the Roman Pantheon in sopme respects. The façade includes incrustation very much like old Roman wall designs. The baptistery is topped with an octagonal dome while the exterior is decorated with an arcade motif with three arches to a side. The domed vault spans 90 feet in diameter which was a remarkable feat for the time. Interior of San Miniato al Monte, Florence (1062-1090): Sits on a hillside overlooking the Arno River. It recalls the early Christian basilica more-so than other churches. 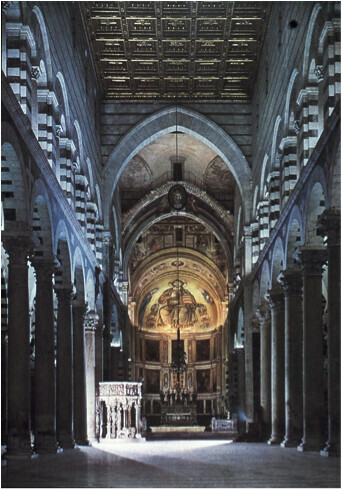 Diaphram arches divide its nave into three equal compartments which brace the wooden roof. We again see the incrustation patterning on the walls. The practice of creating stone sculpture had almost disappeared from art in western Europe due to the transient nature of settlements. A resurgence of sculpting in stone could be connected to an increased interest in classical art and architecture during a period when classical Roman sculptures were moved throughout Europe. Most sculpture was created as part of architectural programs for buildings. South Portal of Saint-Pierre, Moissac, France (1115-1135): This typanuum depicts the second coming of Christ as King and Judge of the world in its last days. Christ is enthroned at the center as was typical for showing a ruler. 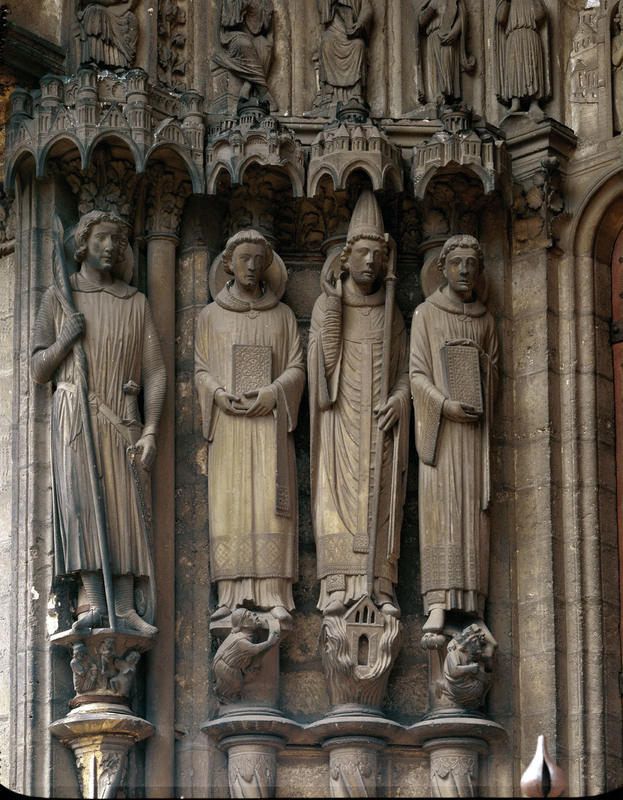 The four evangelists flank him while angels hold scrolls containing the records of human deeds. Twenty-four elders are shown crowned and playing instruments in praise of Jesus; these signify the kings of earth and are divided into tiers by cloud motifs. Lions and an Old Testament Prophet (Jeremiah or Isaiah) are also in attendance. Sculptures are life size though tall and thin, and the cross-legged step gives a feeling of animation. 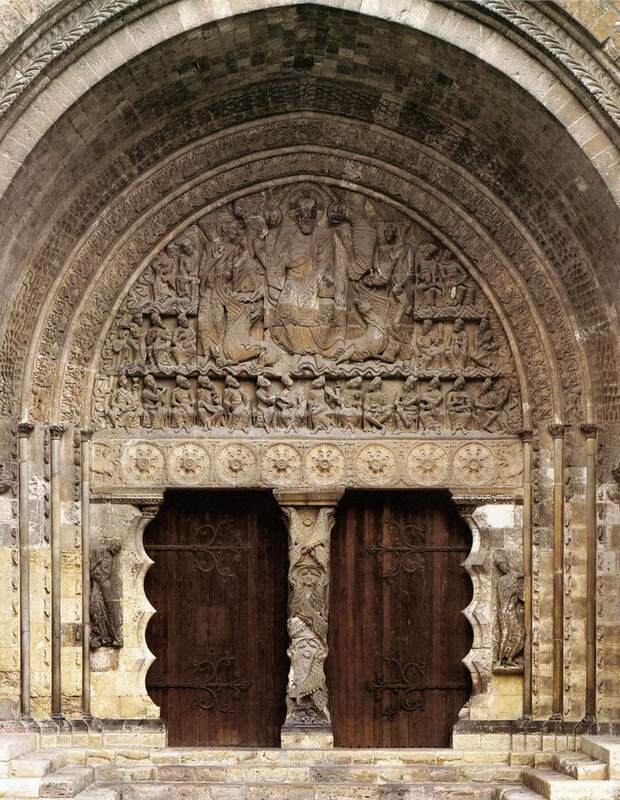 The sculptures are accompanied by a richly decorated trumeau and elaborate door jambs with scalloped contours. A prophet displays a scroll where the vision is written. Old Testament themes are traditionally depicted below the apparition of Christ, as we see here. Six lions, symbolizing courage, fill the outer face of the pillar. This motifof lions or other fierce beastsmay have been borrowed from classical antiquity or even earlier Norse churches. Smarthistory describes a similar portal from the Cathedral of Saint Lazare, Autun, France. Ascension of Christ and Mission of the Apostles (Tympanum of the center portal of the narthex of La Madeleine, Vezelay, France) (1120-1132): Christ foretold that the twelve apostles would receive the power of the Holy Spirit and become the witnesses of the truth of the Gospels throughout the world. Light rays emanate from Christ’s hands. Stylistically, the figures are less constrained within a grid-like structure. Rows of heathens line up along the lintel; they represent those who have not yet come under Christian dominion as well as those with deformities such as hunchbacks. All are in the presence of Christ as saviour, a reminder that passing under the portal will lead to salvation. The theme was relevant as the church was closely connected to the Crusades. Pope Urban II intended to preach the launching of the first crusade from this site a century before the sculpture was carved. King Richard the Lionheart and King Louis VII set out from this location during the third Crusade. It was rare to find sculptures in the round. However, veneration of relics sparked demand for small-scale images of the Holy Family and saints, which were placed in chapel altars. Small wooden devotional images also started being produced in larger numbers. Virgin and Child (Morgan Madonna) (1150-1200): This sculpture represents one of the most popular types of devotional statuary. It is a free-standing version of a Byzantine theme. Mary sits on the throne of wisdom and she in turn becomes the throne for Christ. Christ originally held a bible and his right arm was raised in a gesture of blessing. Once brightly colored, and the figures seem human and less remote than counterparts like the Virgin from Ger described by Smarthistory.org. Head reliquary of Saint Alexander (1145): No expense was spared on reliquaries. This piece houses the relics of Pope Alexander. It resembles the portraits of youthful Roman emperors such as Augustus and Constantine. Almost life size, it rests on four dragons, mythical beasts that were typically found on cloister capitals. The panels depict Alexander II flanked by saints and the nine other plaques (not seen) present female allegorical figures: Wisdom, Piety, Humility, and others. The piece was probably influenced by the transmission of ideas across many cultures because of an increase in travel and trade during these times. For more on reliquaries, read the essay from the Helibrunn Timeline of Art History. Illuminated manuscripts had continued the tradition of painting and painted murals had continually been produced especially in Italy. Murals were popular for decorating architecture, especially on churches as architectural developments allowed for more light. Christ in Majesty, apse fresco from Santa Maria de Mur, Spain (mid 12th century): In northern Spain, Christian art still flourished as the Muslims never fully gained control over the northern regions. This fresco was made for a monastery church. It rejected Byzantine mosaic in favor of painting. The composition includes a star-strewn mandorla flanked by the symbols of the four evangelists. Seven lamps symbolize the seven communities where Saint John addressed his revelation of the Apocalypse. Below are the Apostles. The shapes are simplified into geometric pattern and the blunt directness is reinforced by bright colors. Entombment of Christ (Sant Angelo in Formis, Italy) (1085): The subject here was traditional for decorating apses, which typically focused on the life of Christ. The vaults and other interior surfaces were also usually adorned with paintings. This panel illustrates the entombment of Christ. Mary cradles the head of her son while Joseph of Arimathea and Nicodemus lower him into the coffin and Saint John the Evangelist watches. The painting could be connected back to a Byzantine style. Scriptoria still produced illuminated manuscripts. Books were highly valued and illustrations adorned many of the pages. Initial R with knight fighting a dragon (Moralia in Job) (1115-1125): Initial letters were put to work in illuminated manuscripts! They were often elaborately adorned and even peopled to create narratives. Here, a knight, squire, and two dragons make up the letter R, the initial letter of the salutation, "Reverentissimo." The illustration was an allegory for the spiritual struggle of monks. Ornamented initials such as this can be found in Hiberno-Saxon period as we have seen before, but here it is adopted into a more Romanesque design. Bright colors, and figures taking from a Byzantine tradition while avoiding stiffness and angularity. Master Hugo – Moses Expounding the Law (The Bury Bible) (1135): This bible was produced at the Bury Saint Edmunds abbey in England. The Cistercian order of Christianity called for a ban on figurative art in manuscripts in 1134. This monastery was clear of such a ban and the scriptorium at this monastery created costly books that brought prestige to the monasteries and the owners of such works. This artist's signature adds to the few artists who actually signed their works at the time. Master Hugo was a secular artist who worked on commission for the abbey rather than a monk. The page depicts two scenes framed with floral motifs. Moses is depicted with horns stemming from a translation of Saint Jerome from the Hebrew word which also means “rays.” Moses delivers the laws and points out the clean vs. unclean beasts. The figures carefully fit within each frame and characteristic of other figural works of the time. Eadwine the Scribe (? ), Eadwine the scribe at work (Eadwine Psalter) (1160-1170): The book is considered a masterpiece of an English Monk. It contains 166 illustrations with a self-portrait of the artist at work on the final page, which had become something of a tradition by the second half of the 12th century. The figure is generalized and probably not an attempt at an exact likeness. It depicts the artist in a tradition associated with the evangelists writing the gospels as he proclaims himself a “prince among scribes.” The image clarifies that due to the excellence of his work, his fame will endure and that he can offer this book as an acceptable gift to God. He just barely fits within the frame of the architecture, which is a detail we might associate with Byzantine art and earlier figurative painting. 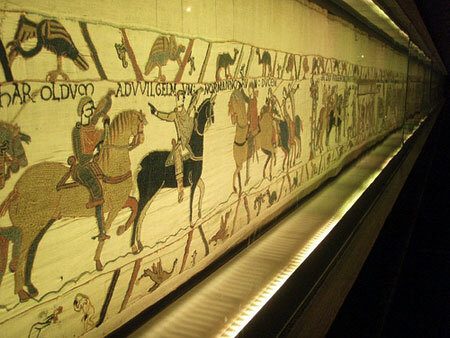 Bayeux Tapestry (1070-1080): Embroidered fabric made of wool sewn on linen. It is closely related to Romanesque manuscript illumination in that its borders are filled with real and imaginary animals like those found in books. Latin text accompanies many of the pictures as well. The tapestry measures 20 inches high, 230 feet long. The frieze-like narrative shows a crucial moment in England’s history and of the events that led up to it: the Norman defeat of the Anglo-Saxons at Hastings in 1066, which brought all of England and much of France under the one rule. The illustration at the top shows King Edward’s funeral procession with the hand of God pointing the way to the Westminster Abbey, where he was buried. Westminster Abbey was one of the first Romanesque buildings to be erected in England and is where William was crowned king of England on Christmas day in 1066. Every English monarch has been crowned there since. The second scene shows the battle of Hastings in progress as the Norman cavalry cuts down the English defenders. It is unique in that it depicts an event in full detail at a time shortly after it occurred rather than scenes from the bible. It is a complete chronicle of events that led up to King Edward's coronation, and it's done in a Romanesque style. Be sure to visit the official website for more information. Giorgio Vasari (1511-1574), best known today as the father of art history, labelled the Gothic style "monstrous and barbarous” because it was invented by the Goths. During the Gothic era there was a revival of art and culture as the artists tended to take from any previous style and incorporate it to new heights, contradicting much of what Vasari claims. 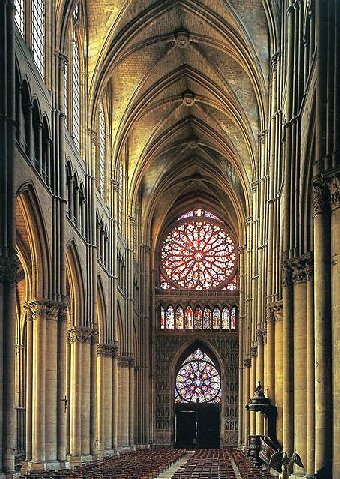 First vestiges of the Gothic style appeared in northern France around 1140. Those in the south were more influenced by Byzantine and Islamic influences as well as the Romanesque style, but each region approached Gothic ideas in their own way. Saint-Denis (1140-1144): Abbot Suger, who ws in charge of the church of Saint-Denis in the mid-12th century, believed that the church needed to be remodelled and expanded both for growing congregations and because it was fit to act as France’s royal church. He remodelled the nave, added a new west façade with sculpted portals, and added a new choir, ambulatory, and radiating chapels. The ribbed vaults rest on pointed arches to create a sense of light and the architectural feature allowed for stained glass windows to let in what he called “Lux nova” or the “new light." Early Gothic: Romanesque in style but flying buttresses allow for an additional arcade story and more light to pour in through the stained glass windows. 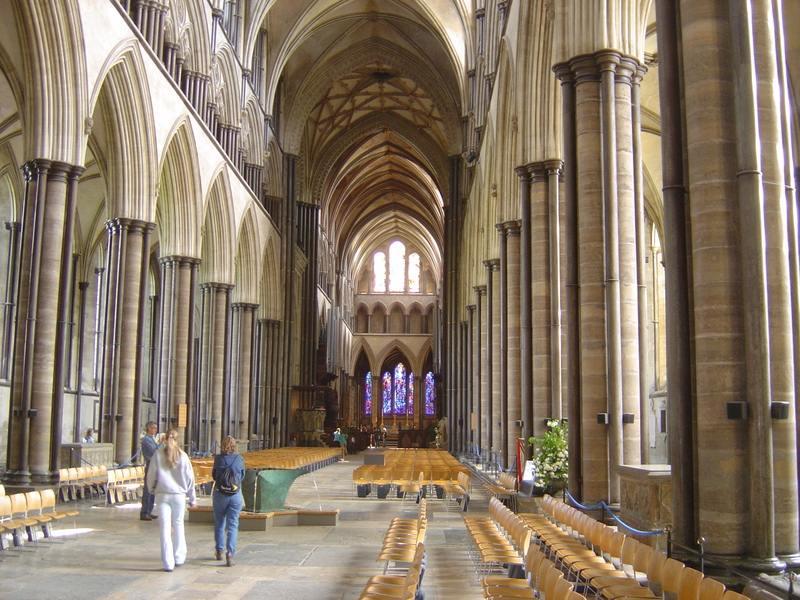 High Gothic: Rectangular nave bays are flanked by single square bays on the aisles. A smaller area is covered by the vault allowing for easier support. Flying buttresses support the walls, but are still engaged within the structure itself, which makes it look larger and stockier when compared to other churches. Buttresses allow for the weight to be supported outside of the wall itself while allowing for large windows to pierce the walls. The sculptures seem attached to the structure, vertical like the columns. They are reminiscent of Romanesque, rigid, and linear. They stand out from the plane of the wall attempting to move into the space of the viewer. 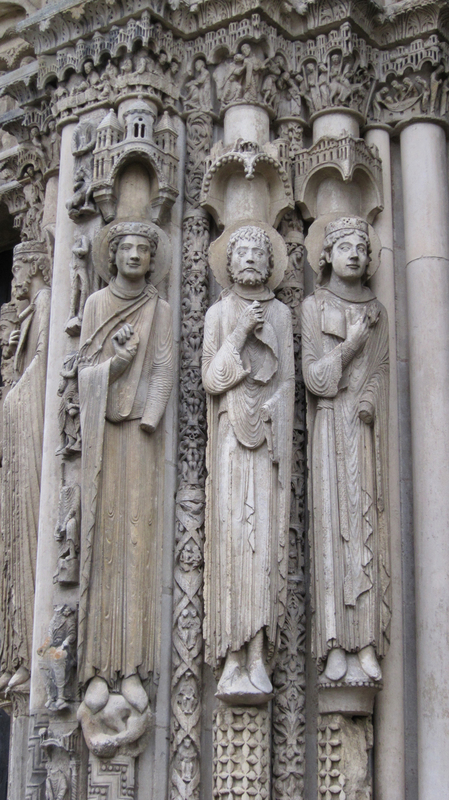 Porch of the Confessors (right doorway): Figures on the south portal jamb project more forcibly into the space. They are seen almost in the round. They break away from the architecture of the building and are more naturalistic. This mimics the transition from archaic to classical style, much like earlier Greek art. Porch of the Martyrs (left doorway): Saint Theodore (martyred warrior) stands in natural contraposto, wearing the armor of a Gothic crusader. He resembles the classical Spear Bearer by Polykleitos. 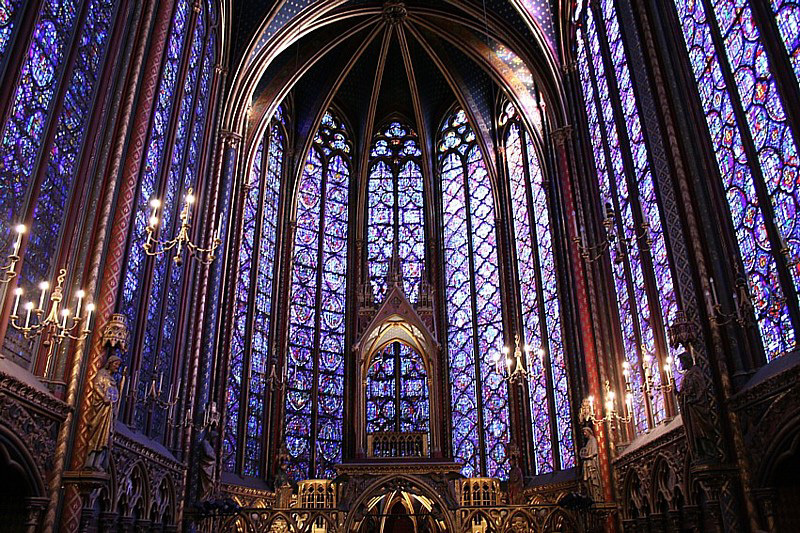 French Gothic buildings often include a rose window and lots of stained glass. Chatres is still relatively dark despite its large windows but it still has its original stained glass. Colored glass dims the light but allows for visual narrative defined by the symbolic light of God. This is markedly different from Byzantine art that used mosaic and gold on the walls to create imagery. 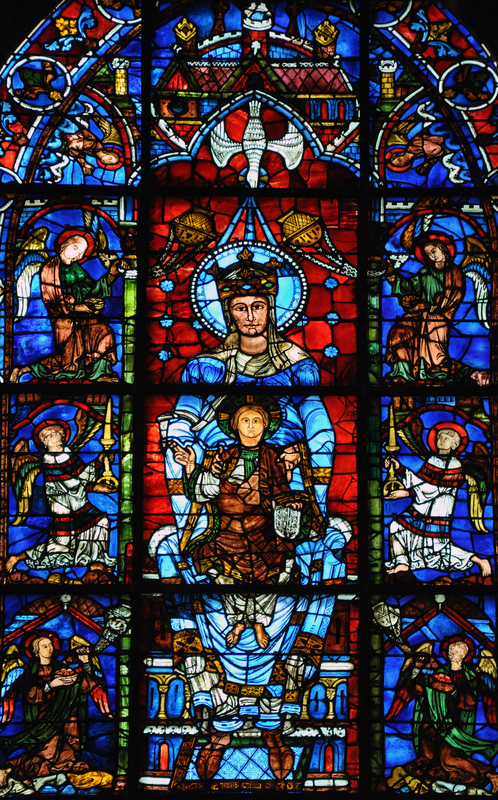 Virgin and Child and Angels (Notre Dame de la Belle Verriere): Early Gothic stained glass style. The composition focuses on the Virgin and Child enthroned with angels on a blue ground.She is shown as the Queen of Heaven. 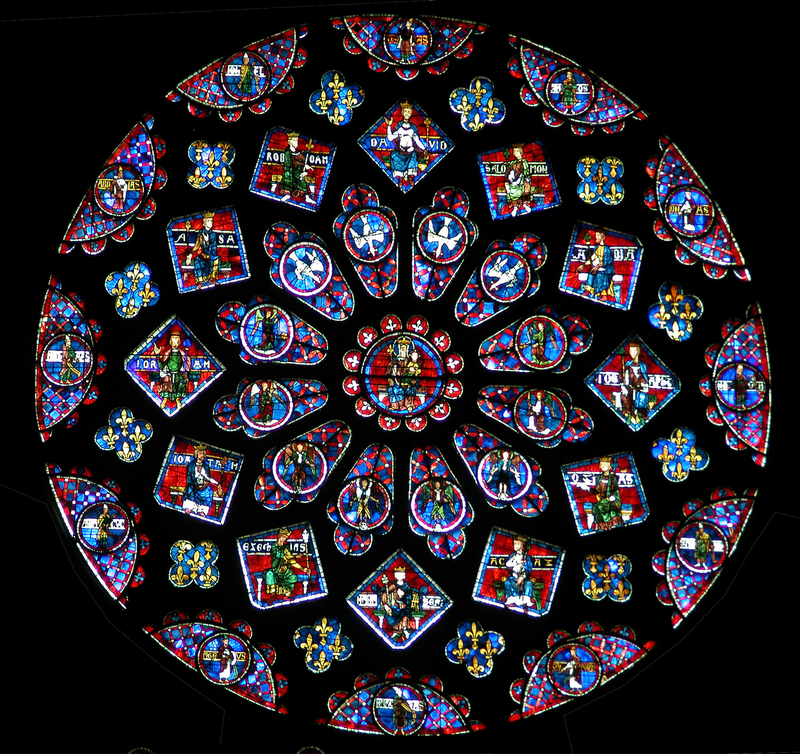 Rose Window, North Transept (1220): This window is a later addition in the high Gothic taste. It was designed to fill the entire wall (43 feet diameter!) and was a gift of the Queen of France, Blanche of Castile. Royal motifs consist of yellow castles and yellow fleurs-de-lis, where are symbolic of the queen and royalty. Other images contain Old Testament kings in square panels and the Virgin and Child enthroned in the center. Narrative and themes differ from one cathedral to the next. Notre Dame, Paris (1163-1200): In 1130, King Louis VI moved his official residence to Paris, causing a building boom. Notice the stained glass, and the thin flying buttresses with a round oculus in each clerestory window. This cathedral begins to fully open up the walls to allow for more glass. Two of the four stories were covered in windows. Virgin of Paris (early 14th century): This sculpture is created with the mannered elegance we associate with King Louis IX’s Parisian “courtly style.” Mary is shown as a queen despite her youth. This also connects to the rising "cult of the Virgin." The mother and child playfully interact in a somewhat naturalistic manner. The treatment of the robes also very natural. It seems to be modelled after the ancient Greek Praxitelean S-curve. 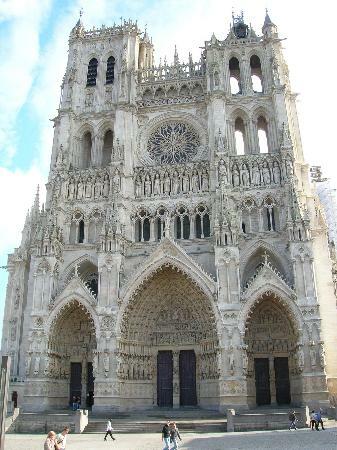 Amiens Cathedral (1220): This church was begun while Chatres was being completed and it uses a similar formula as the one used there. Taller ceilings with larger windows in the triform and clerestory areas allow for even more light to stream into the space. The obsession with constructing taller and taller cathedrals is demonstrated by ever growing heights: the cathedral is tall but also light in feel as the the architects were becoming more confident in their building techiniques. 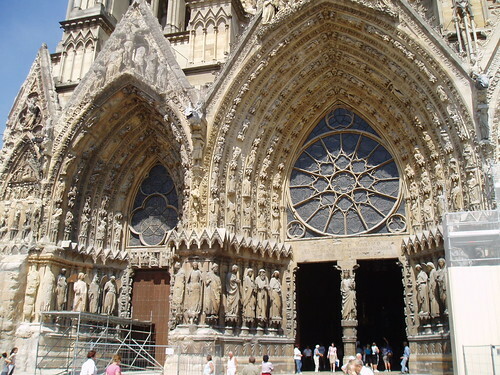 Reims Cathedral (1225-1290): The High gothic sculpture is readily apparent at Reims as they cover nearly every inch of the west façade. Statues begin to interact with one another in a naturalistic way with an emphasis on the contraposto. Sainte-Chapelle (1243-1248): The wall-dissolving of the high Gothic is brought to new levels at this cathedral. The entire building is joined to the royal palace and is considered a masterpiece of the “Rayonnant” style. Most was damaged but repaired in the 19th century after the French Revolution. The windows measure 49 feet high and 15 feet wide, which were the largest up until this time. Salisbury Cathedral (1220-1330): This cathedral might seem a bit more squat when compared to French buildings. The façade does not directly correspond to the three part interior. The tower over the crossing emphasizes that area. The buttresses act more as a prop rather than being important to the vaulting structure. The cathedral has a long rectilinear floor plan but seems to zoom upwards with the design of the interior. The long plan and upward sweep are interrupted by the horizontal rhythm of the vaulting. There are also two transepts, which is highly unusual. German builders preferred the Romanesque style until well into the 13th century, probably because it was still part of the Holy Roman Empire until then. 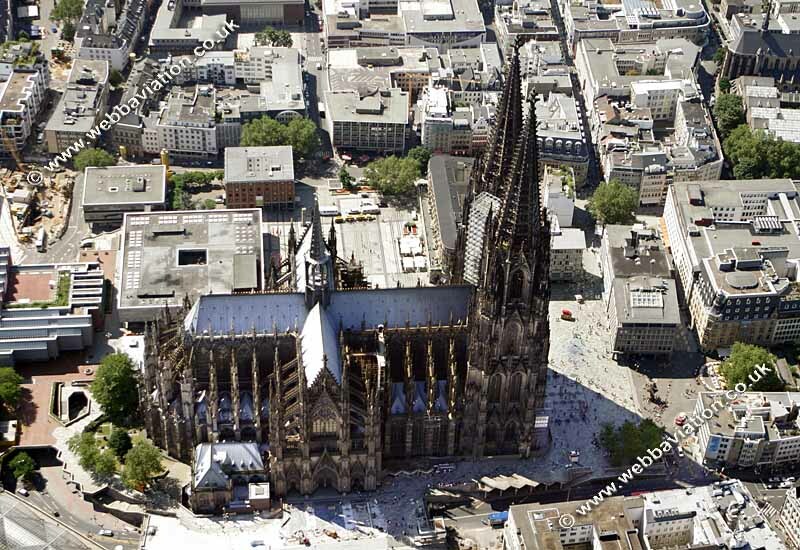 Gerhard of Cologne, Cologne Cathedral (1248-1880): The cathedral took more than 600 years to complete. Constructed was interrupted from the mid-16th to the mid-18th centuries for various reasons. A 14th-century plan was discovered in the 18th century and it was completed to those specifications, maintaining the Gothic integrity of the structure. 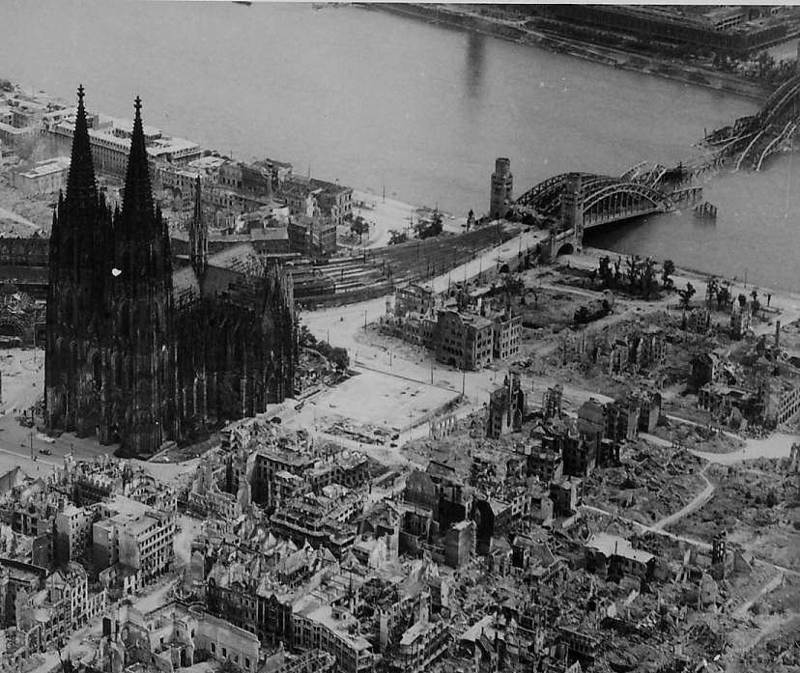 The nave measures 150 feet tall and remained intact even after bombings close by during World War II. 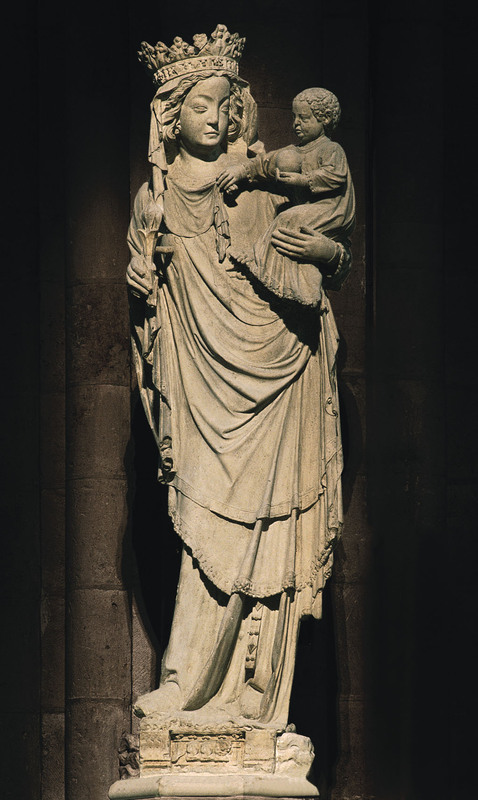 Ekkenhard and Uta (Naumburg Cathedral, 1249-1255): This sculpture is located inside and traces of paint can still be seen. Statues on the façades and exteriors of other cah and transept statues on other cathedrals may have also been painted in such a life-like way. These sculptures represent portraits of donors to the church and may well have been done from life, given the naturalism of the forms. 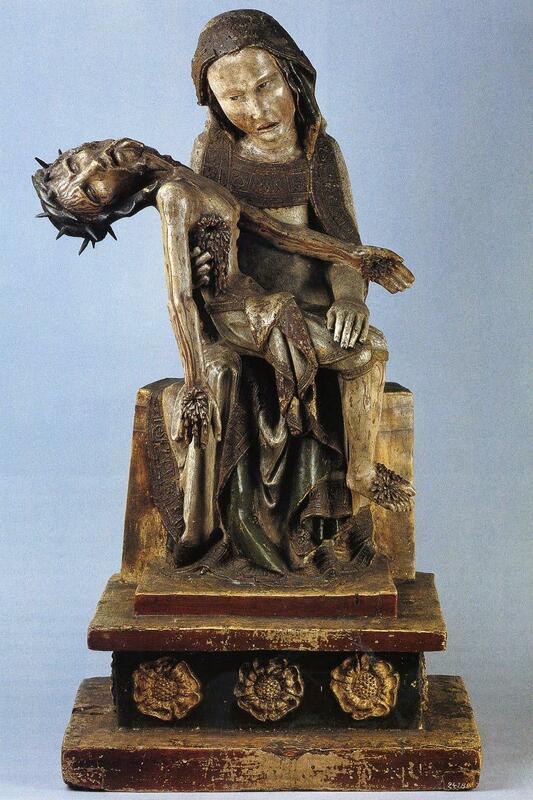 Rottgen Pieta (1300-1325): The 14th century was marked with plague, war, and famine, and many sought comfort in Christ and the Virgin who shared in humanity’s woes. The exaggerated expressiveness may demonstrate the idea of humanizing and bringing emotion into these subjects. Orvieto Cathedral (1310): The Italian Gothic cathedral includes pointed gables, a rose window, and overall Gothic-inspired decoration though the Gothic overlay masks a structure that is typically Romanesque. Doge’s Palace (1340): Venice was most probably the wealthiest territory during these times due to their position in sea trade. 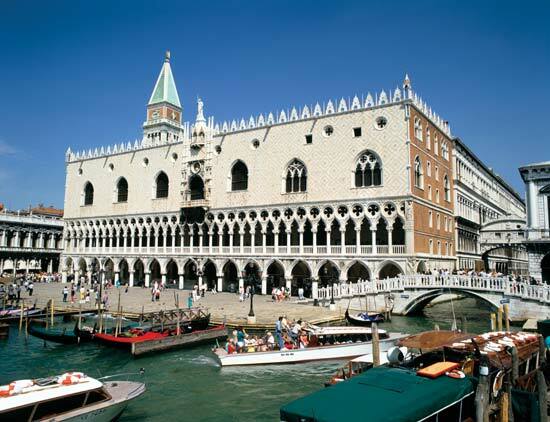 The Doge’s palace is created with a horizontal stress, but is almost a reversal of Gothic tradition making the mass seem lighter as it rises from the water. The lower sections are light and airy, with colorful decorative elements. Milan Cathedral (1386): This structure demonstrates architectural design by committee. It is typical of Italian proportion in that it is wider than it is tall. The surface decoration is influenced by French Gothic tastes. The façade became a mixture of High Gothic and Renaissance influences. 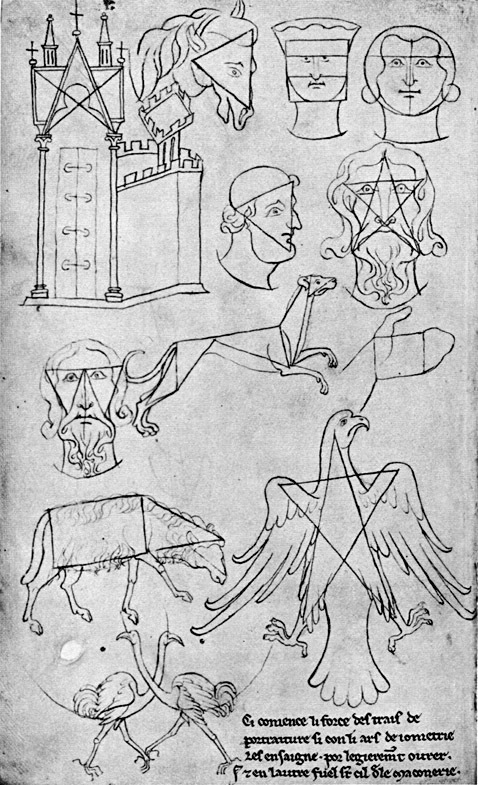 Villard de Honnecourt, Figures based on Geometric Shapes (1220-1235): This manuscript is one of our first representations of a rational look at proportion and form. This artist/architect was strongly influenced by the study of humanism at a time when these ideas led to the driving concepts of the Renaissance. As demonstrated by Villard de Honnecourt, late Gothic Italian artists began to be influenced by humanism as they strove for more naturalism guided by observation. Artists began to become known as individuals for their talents as they produced and signed works that were commissioned specifically because the patron liked their style. Guttenberg would change everything just after this period with his invention of moveable type, which eventually allowed for the dissemination of knowledge in a much more rapid and costly fashion. This is also the period before Georgio Vasari, who wrote the ground-breaking Lives of the Artists, found the Gothic era to be garish in comparison to the new movements of the Renaissance, espeically after Giotto. Stylistically, these last two centuries in Italy before the Renaissance demonstrate this constant movement toward naturalism and humanistic thought. 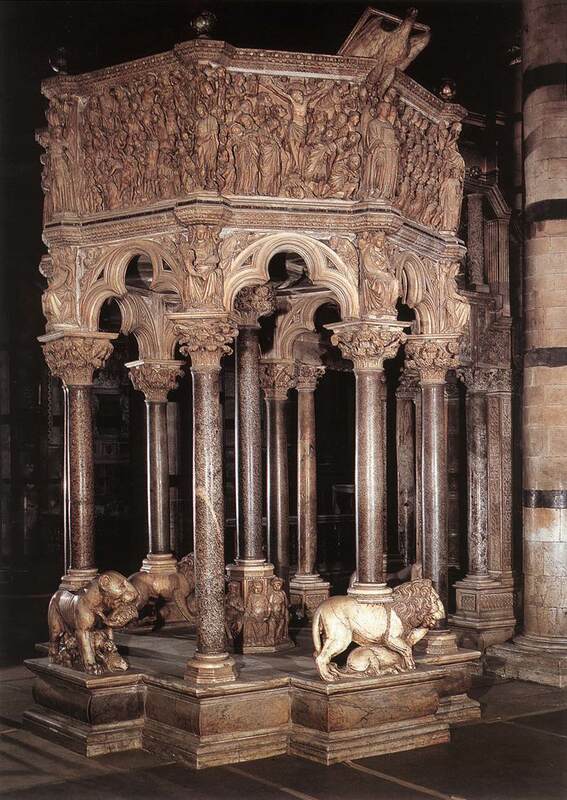 Nicola Pisano, Pulpit of Pisa Cathedral Baptistry (1259-1260): Pisano showed an interest in classical form unlike those before him. His marble reliefs and ornament for large pulpits contrasted with the portal sculpture that had come before. He did use some familiar forms, though, like the trilobed arches and lion motif. Classical elements include the bushy capitals, which were a Gothic variation on Corintian capital, round arches (rather than pointed), and rectangular relief panels that recalled Roman sarcophagi. The Annunciation and Nativity panel is reminiscent of Etruscan and Roman sarcophagi. The weight of figures closely resemble classical relief sculpture. Scholars have been able to find models on sarcophagi that Pisano would have known. Bonaventura Berlinghieri, Saint Francis Alterpiece (1235): This altarpiece was done in a decidely Byzantine style. The pose is frontal and flat and its gold background emphasizes the spiritual nature of the figure and the connection of this altarpiece with earlier works. Side scenes contrast with the stiff frontality of Saint Francis. New religious orders like the Franciscans and Benedictians became more important, and tehy helped spread holy ideas as connected to different saints and modes of piety. Saint Francis believed he could come closer to God by rejecting worldly goods and stripped himself in a public square and he committed himself to a strict life of fasting, prayer, and meditation. He was thought to receive the stigmata for his actions. The robes that he wears became the fashion of the Franciscan Order. Cimabue, Madonna Entroned with Angels and Prophets (1280-1290): We see a new naturalism in Cimabue's work like that found in Pisano's sculpture. This image is still modelled after Byzantine examples with geometry and symmetry in mind. Gold embellishments are also evident influences from the Byzantine. However, Cimabue constructed a deeper space for the Madonna and surrounding figures. Although it remains part of Byzantine tradition, it foreshadows the impending departure in Giotto's work. NOW IN THE YEAR 1276, in the country of Florence, about fourteen miles from the city, in the village of Vespignano, there was born to a simple peasant named Bondone a son, to whom he gave the name of Giotto, and whom he brought up according to his station. And when he had reached the age of ten years, showing in all his ways though still childish an extraordinary vivacity and quickness of mind, which made him beloved not only by his father but by all who knew him, Bondone gave him the care of some sheep. And he leading them for pasture, now to one spot and now to another,was constantly driven by his natural inclination to draw on the stones or the ground some object in nature, or something that came into his mind. One day Cimabue, going on business from Florence to Vespignano, found Giotto, while his sheep were feeding, drawing a sheep from nature upon a smooth and solid rock with a pointed stone, having never learnt from any one but nature. Cimabue, marvelling at him, stopped and asked him if he would go and be with him. And the boy answered that if his father were content he would gladly go. Then Cimabue asked Bondone for him, and he gave him up to him, and was content that he should take him to Florence. Madonna Enthroned (1310): The painting represents sturdy forms and architecture, a sense of perspective, and observation of the human figure is evident. The anatomical form is evident beneath the robes and it is obvious that a model was used for many of the people depicted. Arena Chapel (1305-1306): Smarthistory documentary Part 1, Part 2, Part 3, and Part 4. There was a constant struggle with describing the three-dimensional world on a two-dimensional surface. Giotto used fresco to produce this series of murals for a private chapel for a wealthy merchant near an ancient Roman amphitheatre. The design of the building seems to have been focused on creating a space for interior decoration. Giotto's murals includes 38 illusionistically framed pictures presenting the complete life of Christ. Giotto painted a faux marble effect, which, when coupled with grisaille images, resembles a band of sculpture running across the lowest register. The vaulted ceiling is painted with blue, symbolic of the realm of heaven. The same blue is used in the backgrounds of individual panels. Each panel is framed with a decorative border that separates them into registers. Please refer to the above linked videos for the specific descriptions of some of Giotto's innovations. Duccio Di Buoninsegna: The Republic of Siena was another city body that commissioned many artworks. Sienese patrons were especially devoted to the Virgin Mary. The Maesta Altarpiece (1308-1311): This altarpiece was a major achievement. A central panel measures 7 feet high by 13 feet across, and a number of panels line the front and back of the altarpiece. The panels were cut apart at some point in its history and have been spread across the world in different museums. The painting is ordered according to Byzantine tradition with a rigidity of figures. Duccio, however, individualized the faces and poses and softened the outlines and drapery, though the fact that it was the centerpiece of a church curbed his ability to experiment. He did allow himself some room to experiment on the accompanying panels, as can be seen in the Betrayal of Jesus where there is still the sense of religious drama and stage-like setting, however the bodies here also move with more life and form than previous artwork. Pietro Lorenzetti, The Birth of the Virgin (1342): Lorenzetti was also a pupil of Duccio. He focused on creating convincing spatial illusions. The Birth of the Virgin was painted for a cathedral as part of a series honoring the Virgin Mary. The painting looks almost like a diorama of the narrative. Characters are even cut by the architecture to heighten the sense of space. This was a large step in integrating the figure within convincing architectural spaces. Ambrogio Lorenzetti, Peaceful City (From: Effects of Good Government in the City and in the Country) (1338-1339): Ambrogio was the brother of Pietro and also a student of Duccio. These paintings were done as a part of a series of frescos what acted as something like a town hall in Siena, Italy. The series represents the effects of good and bad government and were done as a sort of reminder by those in charge to keep with the program. The mural project gave the artist the chance to study everyday life and use it as metaphor. It also gave the artist the chance to practice new ideas of perspective in depicting the cityscape and landscape in the paintings of the effects on the country. The Republic of Florence: Florence was another dominant city-state during the 14th century. They expressed pride in their statues and wealth derived from the textile industry and creating the Florin as a monetary standard. Arnolfo Di Cambio – Florence Cathedral (1296): Intended as the “most beautiful and honorable church in Tuscany,” the exterior was modelled in the Tuscan fashion of marble-encrusted geometric design to match the Baptistry of San Giovanni seen before. It departs from the Gothic style we've seen so far. There is no emphasis on the vertical, no sense of stone tracery, and no flying buttresses as it clings to the ground by emphasing horizontal elements. The geometric patterning recalls classical proportions. The dome, designed by Filippo Brunelleschi (1420-1436) is known to be one of the masterpieces of the Renaissance that would follow this period. The nave was designed with the idea of spaciousness and a focus on the altar, as the horizontal drive pushes the eye to the end of the hall. 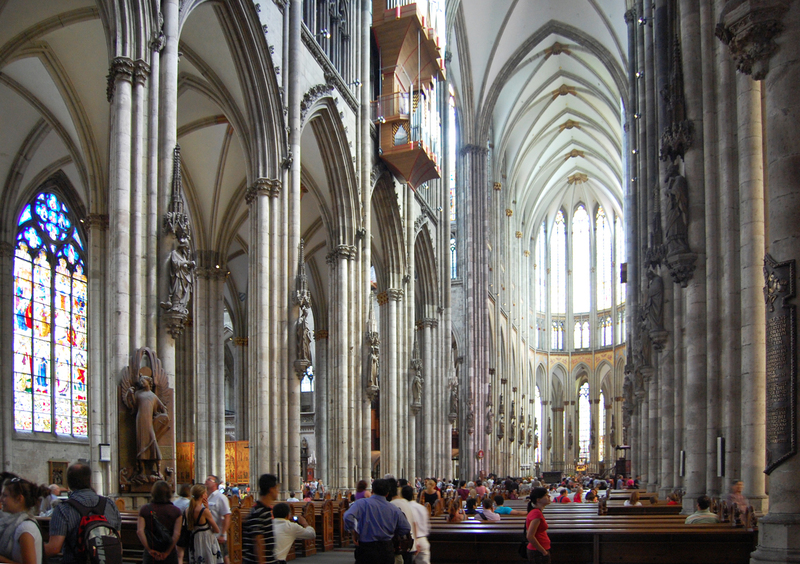 It was designed to fit as much of the population as possible so the aisles become a part of the nave. Giotto di Bondone - Campanile of the Florence Cathedral (1334): The bell tower was designed by a painter. It stands apart from the cathedral in Italian tradition. Gothic towers tend to shoot upward as one continuous element though this tower is subdivided into cubic sections becoming the sum of its parts. The Renaissance idea was to create structures that were developed as the sum of parts where each part was individual yet beautiful and logically worked with the whole. Thus there is less emphasis on emotion and more on intellect.